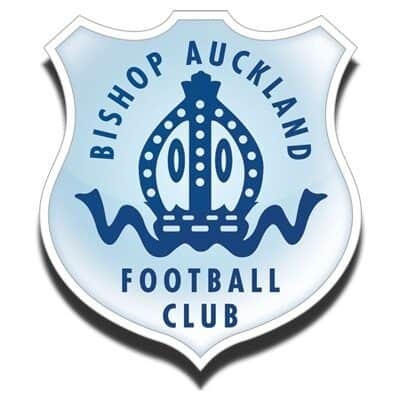 As season finales go Bishop Auckland limped over the line at the weekend, losing 3-0 at home to champions Dunston UTS whilst finishing the game with ten men following midfielder Lewis Gibbons’ red card. Granted a third place finish was the highest the club has finished for some time, earlier in the season there was hopes of the Two Blues finishing as champions – oh what could have been. Trailing to an early goal by the leagues’ leading scorer (31 goals), Mark Fitzpatrick, after just five minutes, it could easily have been a backs-against-the-wall, damage limitation exercise, but Ian Chandler’s weren’t looking for that, irrespective of their emergency room status. Bishops had chances, plenty of them, the champions registered a few as well but it was the bookings that continued to stack up for the home side with both Shaun Ryder and Lewis Gibbons seeing yellow in quick succession, they arriving just after UTS’ Jack Elliott had fired a blistering shot off the crossbar. Just before the interval the Two Blues nearly got back into the game, Gibbons with a thunderous effort form distance which was parried to the right of visiting ‘keeper Dryden; the ball falling at the feet of Bishops captain and number nine, Andrew Johnson (Two Blues top scorer with 15 league). His first touch let him down slightly before Dryden was able to smother the second attempt. 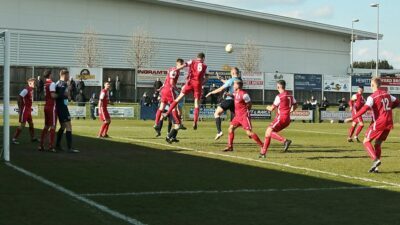 Upon the restart home defender Michael Hoganson sent in a number of attempts on the Dunston goal, the third of which skimmed the top of the crossbar. 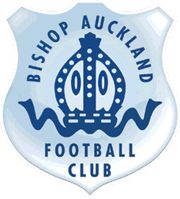 Although still in the game, Bishops were reduced to ten men when Gibbons received his marching order following a second yellow, Arran Wearmouth then proceeding to add himself to the officials’ notebook. The Two Blues continued to hold on but were finally undone in the closing stages when the champions added two further goals, avenging their earlier season, 1-0 loss. 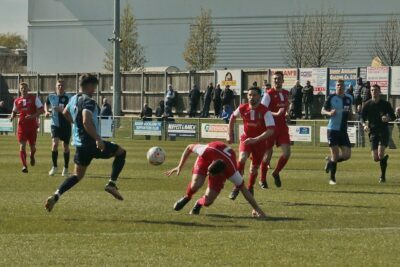 Both sides continued to have efforts on goal and for Dunston it would be theirs that would finally pay off when, with six minutes remaining, captain Dan Halliday finished off a move which included Callum Elliott and Liam Brooks, the latter crossing for Halliday to head home. Deep into stoppage time the visitors wrapped up a 3-0 win when Brooks again proved the dangerman, he linking up with Jordan Nellis before curling home in style to finish what has been a great season for the Tyneside club. Bishop Auckland – Gareth Young; Michael Hoganson, Jamie Marshall, Christopher Winn, Thomas Bott, Shaun Ryder, Kyle Fryatt, Lewis Gibbons, Arran Wearmouth, Andrew Johnson (capt), Darren Richardson. Subs Kyle Patton (on for Johnson), Ryan Robinson (on for Fryatt), Rhys Porter (on for Hoganson). Dunston UTS – Karl Dryden; Callum Elliott, Daniel Halliday (capt), Jake Stafford, Andrew Grant-Soulsby, Daniel Capewell, Craig Scott, Michael Pearson, Mark Fitzpatrick, Scott Heslop, Jack Elliott. Subs Aiden Haley (on for Elliott), Jordan Nellis (on for Heslop), Liam Brooks (on for Fitzpatrick), Cieran Jackson, Desejado Da Silva. “After my first season as ‘Interim Chairman’ I would like to say a massive thank you to Ian, Brian, Paul and all the players, sponsors, supporters, the supporters club, Darren and the bar staff, Laurelle and the catering staff, Chris Burns, my fellow directors and far too many to mention, all the very hard working volunteers at the club; I really didn’t realise how much hard work and time it takes to run a club like this. “I have learnt a lot this season with a lot of people saying I was taking too much on but with the help of friends coming forward it has been an enjoyable and fairly successful season and we’re very happy with 3rd place.